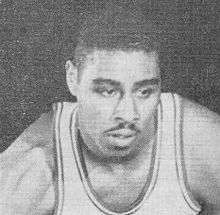 Woodrow "Woody" Sauldsberry Jr. (July 11, 1934 – September 3, 2007) was an American National Basketball Association player. Sauldsberry was born in Winnsboro, Louisiana and graduated from Compton Union High School, where he was the star of his basketball team, and then went on to attend Texas Southern University. In 1957 he was drafted in Round 8 by the Philadelphia Warriors (now the Golden State Warriors). The following year in 1958, he was named the league's Rookie of the Year — the second African American ever to win the award and becoming the lowest overall draft pick ever to win the award, a record he still holds. In 1959 he played in the NBA All-Star Game. Later in his career he played for the St. Louis Hawks, Chicago Zephyrs and Boston Celtics. Statistically, Woody Sauldsberry was an extremely poor shooter, having a field goal percentage of just 34.8% for his career. As a result, he has the lowest number of win shares of any player in NBA history, -7.9. During the 1950s Sauldsberry was part of the Harlem Globetrotters. After becoming bitter over discrimination and shunning the basketball world, he died in poverty in Baltimore, Maryland after having a foot amputated due to diabetes. ↑ "Player Season Finder | Basketball-Reference.com". Basketball-Reference.com. Retrieved 2016-05-31. Fond Farewell – National Basketball Retired Players Association.